Lost in Translation 283: Airplane! Two weeks ago, Lost in Translation covered the difference between adaptations and parodies. The short version is that the two have different goals that can be at odds. Naturally, there are exceptions. Young Frankenstein took the 1931 Universal class Frankenstein and, while keeping the beats, turned it into not just a parody of the original, but also a sequel and a correction of the main flaw Victor Frankenstein had, being a deadbeat father. 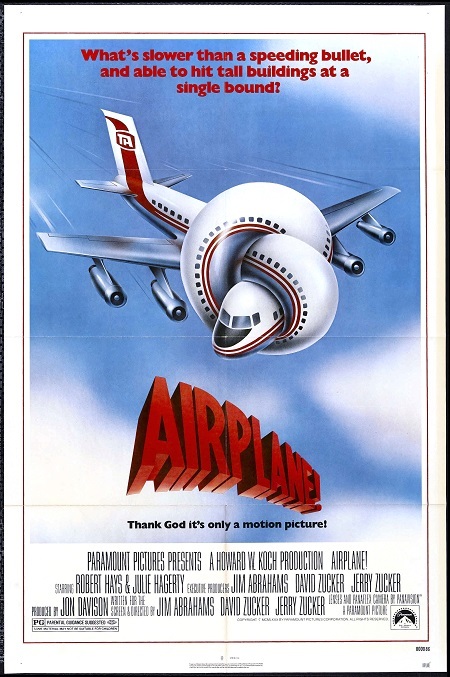 Airplane!, though, is an entirely different kind of parody altogether. During the Seventies, the disaster movie took off. Spearheaded by Airport in 1970, based on the book by Arthur Hailey, many disaster movies came out during the decade, each with a star-studded cast. Airport itself spawned three sequels, Airport 1975, Airport ’77, and The Concorde – Airport ’79. Other disaster flicks of the decade include 1974’s The Towering Inferno and Earthquake and 1972’s The Poseidon Adventure. Audiences were drawn to mass destruction on film. Naturally, when something gets popular, it gets parodies. David Zucker, Jim Abrahams, and Jerry Zucker decided to take improv act Kentucky Fried Theater and turn it into a movie, The Kentucky Fried Movie, One segment of the film was “That’s Armageddon” which parodied the disaster movie genre, though using a tower on fire instead of an airplane. While ZAZ didn’t direct the film – that was left to John Landis – they wrote the script. With a successful film under their belt, they decided to parody an old film, taking one they had recorded overnight. The lucky film was Zero Hour!. 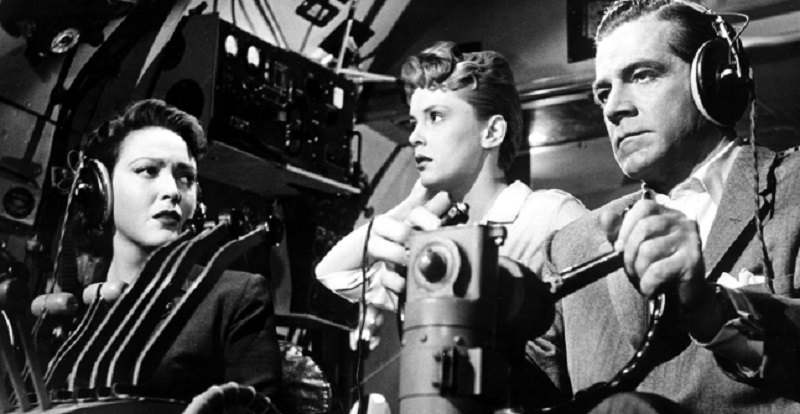 Adapted from the CBC teleplay Flight Into Danger, Zero Hour!, written by Hailey, told the story of Ted Stryker, played by Dana Andrews, a World War II fighter pilot who lost his squadron on a bombing mission five weeks before the end of the war. The target was shrouded in fog and the strike force came in too low. Stryker survived, but six of his fellow pilots never made it back. Eleven years later, Striker is having problems holding down jobs to the point where his wife, Ellen (Linda Darnell) leaves with their son, Joey (Raymond Ferrell), to fly across Canada to Vancouver. Stryker catches up at the airport, buying a ticket on the cross-Canada flight. 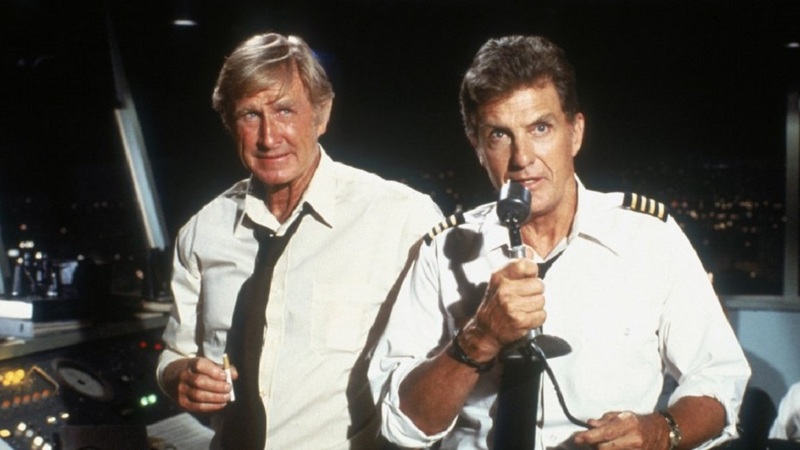 Cut to the cockpit, where the pilot and co-pilot (Elroy “Crazy Legs” Hirsch and Steve London) are discussing the flight. A fog is covering the Prairies from Regina to Calgary, but since the flight is going to Vancouver, that shouldn’t be a problem. A four-engine DC-4 should be able to get from Ottawa to Vancouver without having to stop to refuel. Once the passengers are settled in, the plane takes off. Ted tries to talk to his wife, but Ellen’s mind is made up. To help pass the flight, Ted asks the stewardess, Janet Turner (Peggy King in her first movie role), if Joey can visit the cockpit. With the pilots’ permission, Ted and Joey take a look around. While there, Janet gets the pilots dinner orders, both of them going for the grilled halibut. With Joey welcome in the cockpit, Ted goes back to speak to his wife to find out what went wrong between them. The first hint that something’s wrong comes after the plane has flown into a thunderstorm. A woman starts complaining about severe stomach aches. Janet fetches her some Dramamine to help, then calls the pilot on the intercom. She believes the woman has severe airsickness, but she’s never seen it this bad. The pilot asks Janet to find a doctor on board. After asking a few passengers, Janet finds Dr, Baird (Geoffrey Toone) and asks him to take a look at the sick woman. As Baird examines the woman, Joey gets the same symptoms. The problem is severe; the doctor wants the plane on the ground as soon as possible. The problem is that the fog is thick all the way to the Rockies; there’s nowhere to land except Vancouver. With some questions, the source of the illness is traced to the fish. Everyone who ate fish is going to become violently ill, including the pilots. The co-pilot is the first of the flight crew to be affected by the illness. The pilot toughs it out with some help from Dr. Baird, but soon is not able to continue flying the plane. He manages to turn on the autopilot to keep the plane on course, but someone needs to land the craft. Janet goes walks along the aisle, looking for someone who can take over. To keep the passengers from panicking, she says that the co-pilot is ill, but the pilot just needs someone to handle the radio. The only passenger on the flight who has any flight experience and hasn’t had the fish is Ted, and he’s hesitant because of what happened in the war. On the ground, the airline realizes there is a problem in the air. Harry Burdick (Charles Quinvlivan) takes charge and calls in Martin Treleaven (Stewart Hayes) to help talk the replacement pilot down. Problem is, Treleaven flew with Ted during the war and is well aware of Stryker’s record. Both men have to put aside the past to work together to get the plane down. Emergency crews and gear are on standby, in case Stryker misses the runway or even the airport. Ted, though, gets it together, fights through his PTSD, and makes the worst landing Treleaven has ever witnessed. At the end, though, the plane is down with no loss of life. The plot to Airplane! is the same, beat for beat. ZAZ added to the script, embellishing scenes in the Zero Hour! and adding scenes to parody the Airport series of films. Changes were made, the biggest being moving the setting south to the US with a Los Angeles to Chicago flight. This change meant that the airline had to change from Cross Canada to Trans America. Characters were renamed. Ted Stryker became Ted Striker (Robert Hayes). Ted’s wife Ellen because his ex-girlfriend Elaine (Julie Haggerty), a stewardess on the flight. The stewardess Janet became Randy (Lorna Patterson). Dr. Baird turned into Dr. Rumack (Leslie Nielsen); Burdick, Steve McCroskey (Lloyd Bridges); Treleaven, Rex Kramer (Robert Stack). Airplane! expanded the flight crew to three, due to the needs of the Boeing 707 replacing the DC-4, thus having Captain Clarence Oveur (Peter Graves), Roger Murdock (Kareem Abdul-Jabbar), and Victor Basta (Frank Ashmore). The changes of the crew name allowed for some word play during take-off. One thing that didn’t change with the flight crew was including a sports figure. “Crazy Legs” Hirsch was a receiver with the LA Rams at the time of shooting Zero Hour!. Kareem Abdul-Jabbar played for the LA Lakers and was dragged out of the cockpit wearing his uniform. One role that got expanded was that of Johnny, who was essentially a gofer. ZAZ and Landis handed the role to Stephen Strucker and let him do what he wanted. The result, Johnny went from extra to manic character who was in his own movie, one where there wasn’t an airplane without a flight crew doomed to crash. The new Johnny also provided contrast to the ultra-serious nature of the plot. 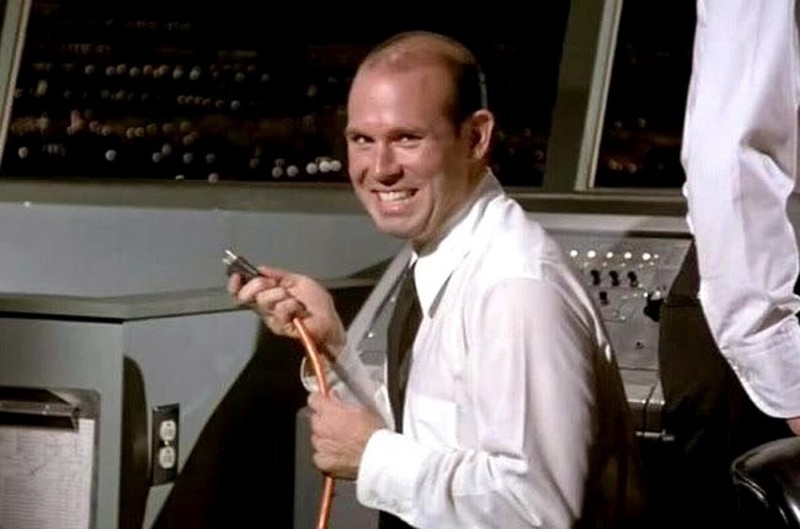 Not every scene in Airplane! came from Zero Hour!. Scenes at the airports, both in LA and Chicago, were added. These came from the Airport series, where the scenes set up the in-flight character drama. The young transplant patient, Lisa Davis (Jill Whelan), and the singing nun (Maureen McGovern) came directly from Airport 1975. The additional scenes allowed for more gags, including the argument over what the red and white zones are for and Kramer fighting his way through religious missionaries. 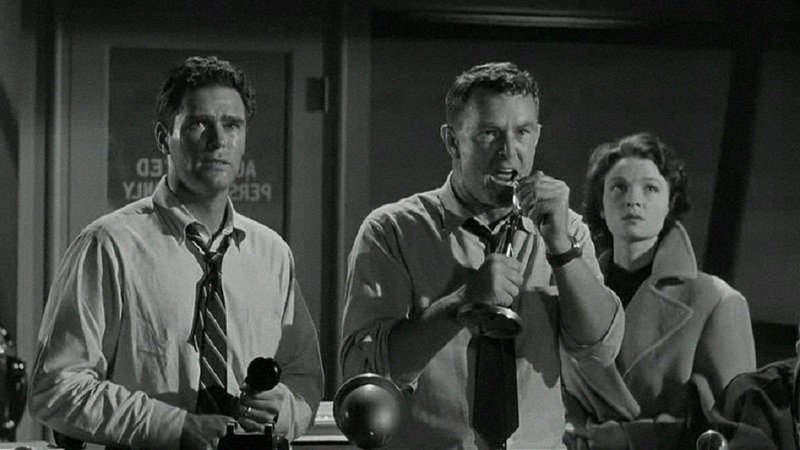 In the air, the added characters allowed more parodies, including of coffee ads and of a scene from 1958’s Crash Landing. Not every scene was a spoof, though. Some were played straight. Near the end, as Ted is bringing the jet in on its final approach, there’s a shot of an older fire truck with firefighters watching the sky with a dalmatian. That had to be tossed in, right? The truck is out of date, and dalmatians aren’t used for firefighting except as mascots these days. That shot, though, came right out of Zero Hour!, the only difference being the breed of dog. The final approach and landing, outside Johnny’s antics and additions to dialogue, were beat-for-beat and almost word-for-word from Zero Hour!, including how the plane crashed on to its belly and skidded. The popularity of Airplane! and the nature of the jokes wound up killing off the disaster movie for a decade and a half. When the genre began a revival in the Nineties, the focus was more on natural disasters, not airplane crashes. Arthur Hailey, having written Airport, not only created the disaster movie trend in the Seventies, became its end through the spoofing of Zero Hour! The drama of those films could not be taken seriously because of Airplane! Given the nature of Airplane!, it would be expected that major changes would be done to Zero Hour!. 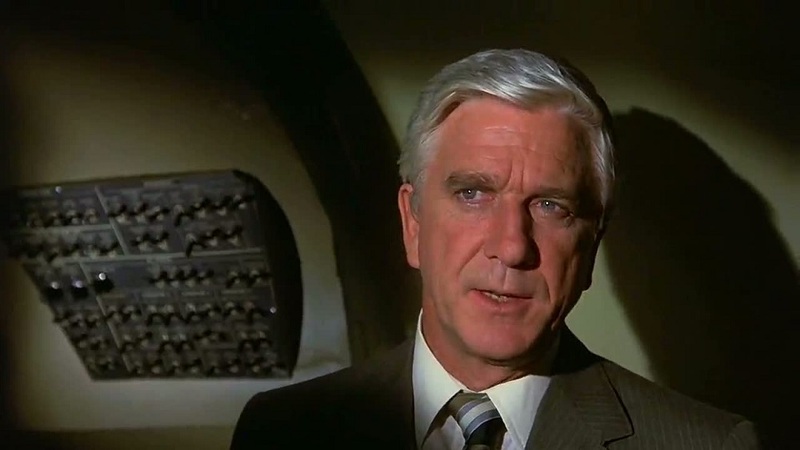 What’s surprising is how intact the original movie is, turning Airplane! from parody to comedic remake. In Airplane!‘s favour, Zero Hour! was a black and white film relegated to late night TV slots, the periods where few people watch or even record. There was room for an update of the original, going from propeller aircraft to jet, though ZAZ still kept the prop sounds. More people are familiar with Airplane! than the movie it remade. Without Zero Hour! to build on, Airplane! wouldn’t be as well-known or loved today. Airplane!David ZuckerFrank AshmoreJerry ZuckerJim AbrahamsJohn LandisJulie HaggertyKareem Abdul-JabbarLeslie NielsenLloyd BridgesLorna PattersonLost in TranslationPeter GravesRobert HayesRobert StackScott DelahuntStephen StruckerZero Hour!